See also: I've seen many people work on Starfleet since Protect the Timeline came out, but this is out first winner using the two together. Why did you choose the deck that you used? What other decks did you consider using? Time has been my enemy of late. Moving house in the last few months ate up my free time - so my capacity for deck building was limited. I missed out on several tournaments in Grimsby and had to rearrange this regional to the very last week of the season to have chance to squeeze it in. But I've always loved using Time Locations - from Hero of the Empire decks, to Khitomer Klingons, or maybe just a Drone Control Room to grab Gareb and bypass Quantum Incursions. The one location that hadn't really worked was 22nd Century San Fransisco - limited to just one free play, Starfleet had struggled to compete. And Protect the Timeline (from Through the Looking Glass) did wonders to not only add a second free play, but give them a built in time travel mechanic too. However the personnel pool was still really limited. Or is it? Seat of Starfleet plays at the Time Location and has normal reporting rules. So I can report Non-Aligned personnel there - as the extra free plays from Protect the Timeline. It's a weird loophole, but it works. And until Project Sloane and the Enterprise Block, I think it's the best we have to work with. Besides, getting Galen, Beverly and Will, Lore, Thomas Paris, Koral, Joachim, Ruk etc all for free? That's cool. Although strangely my opponents disagreed! Speaking of cool, throwing Non-Aligned non- personnel into a Starfleet deck does mess with the traditional Starfleet draw mechanics (Finally Ready to Swim, We're Ready). So I reverted to an old classic: Temporal Shifting and Parallax Arguers. 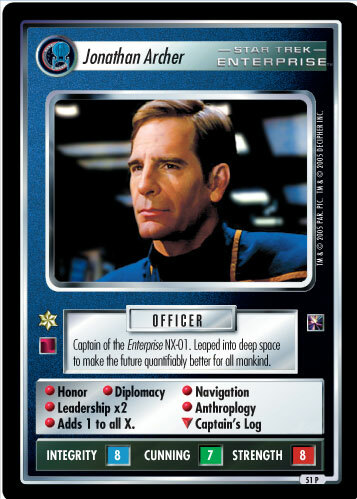 And, oh boy, do those Parallax Arguers work well with Jonathan Archer's special skill! Chuck in a few Whales, a Phoenix, and a two mission win was looking fairly achievable. As a backup for draws, I also threw in Grand Nagus Gint and 35th Rule of Acquisition, which also made me structure the missions to look like I was playing some sort of bizarre Ferengi deck! The only other decks I'd been considering were the existing builds I had with me: a TNG Fed deck with the Love Cafe, a Romulan Double HQ and Son'a build, and a simple Cardassian solver I lent out to another player. What sorts of decks were you hoping to face while playing your deck? What decks did you hope not to face? I was expecting to see more Mirror Universe tech - particularly Terran Empire. Dominion can also splat out people very fast, and one of my opponents has a preference for them. I didn't want to see Borg - Earth always makes too easy a target for them! I also wasn't keen on other Earth-based decks (Starfleet, Federation, etc) as that would probably mean an overly spaced out spaceline around my base of operations, which could hurt me on range. Prior to this tournament, did you have much experience playing this deck (or decks like it)? Did you learn anything new about it when you played it this time? I'd never really used Parallax Arguers and Temporal Shifting as a draw mechanic before. It's only one net draw (need to replenish Parallax, Temporal Shifting, and a discarded [1E-AU] card), or two net draws if you play Temporal Shifting as your card play. So I did a lot of practice draws to make sure the ratios were fairly reliable. I'd only played Starfleet once before, in an online Random Affiliation tournament, so had been forced to use 2EBC cards to fill skill holes, and was determined to find a way to avoid that this time. Lessons learned? Constantly interrupting your opponent with "That's cool", really isn't cool! Thankfully they had beer to appease them! Did you use any situational cards (cards that you wouldn't expect to be useful in every game)? Are there any whose usefulness exceeded your expectations? Were there any that you wouldn't include if you played the deck again? Altovar, Gem and Vina were mostly to help get past the Empathy requirement of Quantum Incursions, but I only encountered it once, and that was a mis-seed (lack of appropriate doorway). My Xepolite Freighter proved bloody handy for moving a Garbage Scow. Going to the Top is good in most decks. Fetching Jonathan Archer was really handy, and if I hit a second copy I could still grab Mr Sisko. I'd stocked a lot of Navigation as one of the missions I wanted to attempt required Navigation x2 - but it also proved handy getting past Caretakers Wave, as I had sufficient Navigation even after I'd sent one shipload of people to the Delta Quadrant for a laugh! What would you nominate as the MVP card from your deck? Probably Jonathan Archer. Boosting Parallax Arguers to be 1 point or 6 points means that every choice feels like a win! Do you have anything else you'd like to say about your deck? Does it play by the accepted rules of Time Locations? Probably not. That loophole is probably going to cause issues for developing Starfleet (and Vulcans) in future, as the designers will need to consider the Non-Aligned combination options. Equally, there are a lot of free bonus points that Starfleet have easy access to with Whales and Phoenix. That should be addressed at some point, as it feels unbalanced for DQ to be aiming for 140 points, while Starfleet just need to hit say 75. Also, Worlds is now just 2 months away! Get ready people - buy your tickets and make your way there - cause London is going to host an awesome few days of Trek! I've often wondered what the "correct" thing to say about Parallax Arguers is. It is usually paired with some sort of card draw engine, be it Temporal Shifting in this case, or something like Kivas Fajo - Collector. Because of that, my instinct is to just agree that whatever it is is cool, give the opponent the 5 points, and make them continue to use their card plays to draw cards. Of course, against a deck like this one, with oodles of bonus points from things like the Phoenix and the whales already, that makes a two-mission-win almost painfully easy, so I could be wrong. It just feels bad to give my opponent basically free card advantage (even if it is only one net card at a time) - though I imagine it would feel bad either way with Archer in play. The free Non-Aligneds to Seat of Starfleet with Protect the Timeline is probably not intended, but I think it is a pretty clever discovery. Additionally, it is really nice to see some of these names again. Since War Council was banned in OTF, the only time I've seen personnel like Beverly and Will pop up are the rare Open-format online events. 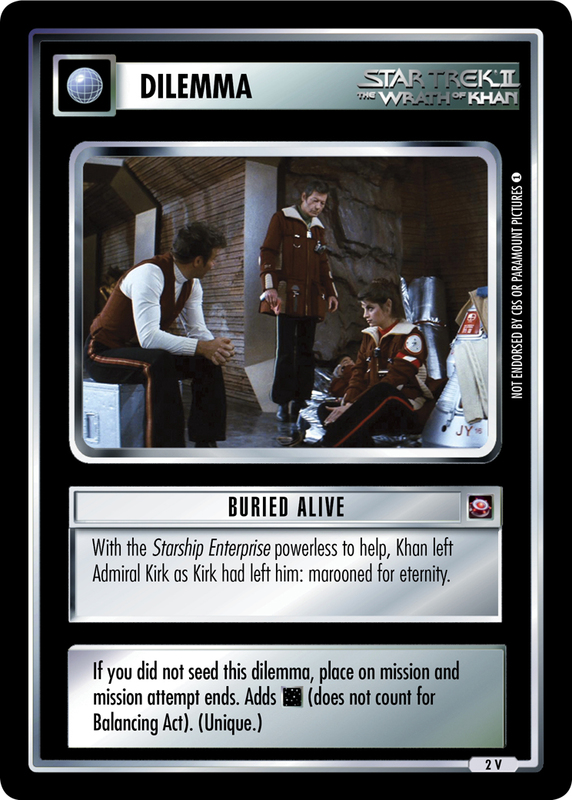 It's not that these cards are bad - equipment special downloads can be game changing, especially a flexible one like "Any Tricorder". It's just that there are only so many slots in competitive decks for nouns that take your card play and aren't ships, and perennially homeless personnel like Beverly and Will seldom make that cut. The 35th Rule of Acquisition is one of those draw engines I want to try using myself, then forget about it until I see that one deck per year using it. 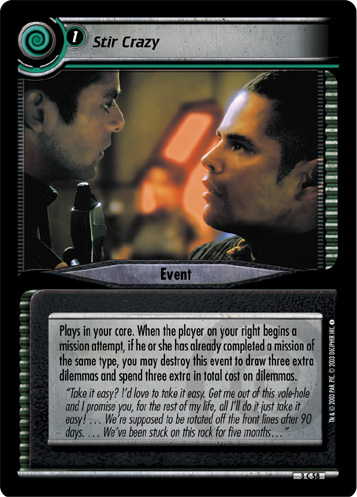 It can even be used with Reshape the Quadrant decks, since Gint is DS9-logoed, and is basically an end of turn draw for two seed slots - if you don't intend to battle. Starfleet is pretty safe from battle due to its Time Location's text, and though Paddy was running a Battle Bridge Side Deck, I suspect it was there largely for dilemmas (four of which deal damage to ships). Next time I make a pacifist Reshape deck, I'm going to remember to use it, really for sure this time. Title: The Holograms lost Gem at the cartakers array. See also: This is our first Delta Holograms winner, but it feels pretty similar to Ken's recent Hirogen Solver. Why did What achievement(s) led you to choose the deck that you used? What other decks did you consider using? Day 1 - it was Children of the Light + Hirogen Affiliation deck for achievements. Day 2 - Because I had won day 1 I dropped the actual Children of the Light card since it was just a dead draw, and shifted the deck to just get the Hirogen Affiliation play hit. I had vague thoughts about doing new Mirror TOS achievement but that deck had to start from scratch where as some of the idea for this deck had been worked on helping Roxanne with her version and the Hirogen deck I had just used a few times locally so this could be built fast and as time wound down I decided to go with this one. I wasn't really hoping to face/not face anything specific really. I mean I knew going in battle would be a horrible match up and a VERY hard game I should lose with either version of the deck so in a way I would hope not to face that but then I wasn't expecting to do as well as I did, and was just playing to have a lot of fun with a deck I knew I'd have fun with win or lose. I've played several Hirogen decks before and several hologram decks before (for a fed version, see worlds 2012 day 1), so while I haven't played this specific deck before several variants i am experienced with. I learned a new trick with Genesis effect towards the end of day 2 I will have to remember if I'm using it again in the future to dodge dead end. I don't know if I'd call any of the cards situational really, but I would swap the med kit out for either of the Gun downloads I have access to, they would have helped more then it did. The one card I put in that was situational or that I expected to be situational was The Genesis Device, it ended up just being great in almost every game, because I guessed the meta better than I expected and while I had expected only a few people to be running D.O. or other anti Gen Device tech, I ran instead in to zero people running any of it, and manged to not put it behind a problem wall like dead end at all so it was much easier to use then expected and far exceeded my expectations in this specific event, but there was clearly some major luck involved in that result. If any one is copying my Day1 version of the deck I HIGHLY recommend you fix my huge mistake, and either change out the two space dilemma combos OR like I did for day 2 put Caretaker's Array back in so the dilemmas actually present a hard choice to your opponent. I lost the first game of the day when I didn't realize that until too late and my supposed strong combos I placed where he would likely go first were instead my weakest combos, after that I tried to put stuff in different places and covered for my oops a bit so remember folks when you're running dilemmas that need Caretaker's Array DO NOT cut it from your deck in the last minute last revision because you don't think you really need it. I did it guys! Remember back in week 9, when I couldn't figure out what Buried Alive was good? I know now, and all it took was a whole crew of "innocent" Cardassians. Buried Alive -> The Arsenal: Divided -> "God" is pretty good at setting up a crew for being squished by a giant, omnipotent hand. Also handy to know is that it is a tough combo to beat while still not voiding the personnel attempting requirements on The Genesis Effect, so you can often put a Dead End behind it at a headquarters and still have it hit. Of course, an HQ is one of the easiest places to get a replacement ship to, but if you've lost your ship then you've also lost a decent number of people. Cool combo. The other cool combo here is Arsenal -> Devastating Communique -> Caretaker's Wave. The Battle Bridge side deck is set up to deliver a guaranteed ship destruction with three flips, and with two choice stops beforehand, it's pretty likely to hit. Alternatively, you can opt to strand yourself in the Delta Quadrant, but Ken has no stealable missions, and no Mission IIs to help you get home, so most of the time it's a fate worse than death to pick that option. Of course, it's worth checking to see if there even is a Caretaker's Array on the other end of the Wave - if there isn't you can just get the one flip and a sigh of relief. This actually isn't the only Delta Hologram Genesis Effect Two Mission Win deck that I faced (and lost to) on day one of Continentals. Phil was playing one too, and I got to experience firsthand how effective Holographic kill prevention is, twice. I thought A Fast Ship into Executive Authroization (after an attribute wall) was pretty sweet, but The President of Earth just reactivates next turn and provides the necessary memo (I've always assumed that you get past that dilemma via memo). The Weak may Perish, and there may be Rules regarding Obedience with deadly punishments, but when no one really dies, walls get overcome sooner rather than later. Time for me to try some holographic fun perhaps. See also: I took inspiration from several places, notably: my ALC/Kill version, Will Raiman's Unfair/Overwhelmed Pile, and a variety of pre-Guidance-nerf Alex decks. I only packed 4 decks (plus odds and ends for minor adjustments), and my original plan had been to play Klingons on day 1, but at the last minute I switched to using a more familiar (and faster) deck for the longer day. I also brought a slim Starfleet build and Vintner Jaeger Bomb, but for day 2, Klingons just felt like they were well-rounded enough for what I might face. I feel like Maquis, Romulan Discard, and Jaeger Bomb are probably the most difficult match-ups for K'mtar these days, and I thought all three were unlikely from my competitors. I was worried about Assimilation from Nick - I thought K'mtar might be able to do okay there, but I'm definitely underexperienced in facing them. In personal playtests, my deck has done very well versus 5 Space Voyager, so I was looking forward to a true test since I knew Will ran Firestorm in his version. After weathering a Desperate Sacrifice in my game against Will, I suspect I could have survived a Firestorm. I played an Aid Legendary Civillization version of this deck with a kill pile in a Regional a few years ago, but this is my first time with the two mission win and an Unfair Comparison pile. I was worried this deck would be too slow (it was much bigger than my older deck), but it seemed to move at a decent clip in the tournament. I was running Delirium largely to counter the dilemma choke from new Chakotay, but it turns out it also does a great job of countering the cost bumps from the Stakoron missions. M'Pella was in there just to be a good target for Adopted Authority and to be an Anthropology that was protected from Accelerated Aging. It's tough to assess the effectiveness of a card that is there to make sure you don't see certain cards - the same effect often causes inexperienced players to question the effectiveness of Security Drills. But I didn't hit a single Accelerated Aging all tournament, and had her for the first mission attempt against Phil. The Sword was in the deck more as a defense against Adopted Authority, since the Strength numbers are already so high - but I never drew it in the tournament. Grav-Plating Trap protected a Bridge Officer's Test from a Our Death against Nick, definitely earned its spot (though Emergency Transport Unit's only use in the event was to fuel the Trap). Against Phil, who had plenty of Events I could want to destroy, Korath just sat in my hand with an ETU, waiting for a turn where I could want to spend a full 8 counters to destroy an event that Phil might just replay. That obviously never happened. Korath is already a D-list Council Member due to his cost and skills, he probably would not make the cut for the next version. Lots of good cards here, but I've got to give the award to Stir Crazy. In my game against Phil, where my K'mtar/Guidance/K'Tal deck didn't get any of those three cards until I was half-way through a 71 card deck, Stir Crazy was all that stood between me and losing. When I finally did play K'mtar on probably my second to last turn, I almost auto-pilot-picked Energize/Delirium (both were still available), but caught myself and went for the much more impactful Stir Crazy/Delirium. I do believe that this deck is a tool in the anti-5 Space Voyager arsenal, but that doesn't mean that I don't think that 5SV is still having an oppressive effect on the game. I'd also like to give credit for the hybrid Unfair/Overwhelmed pile to Will Raiman, whose pile I started from when making mine. Finally, I want to thank the Floridians for once again putting on a great show for us travelers and being incredibly gracious hosts. I'm glad it is convenient for me to schedule family vacations for the weeks surrounding the event, because I would hate to miss any Orlando Major going forward. Discuss this article in this thread.